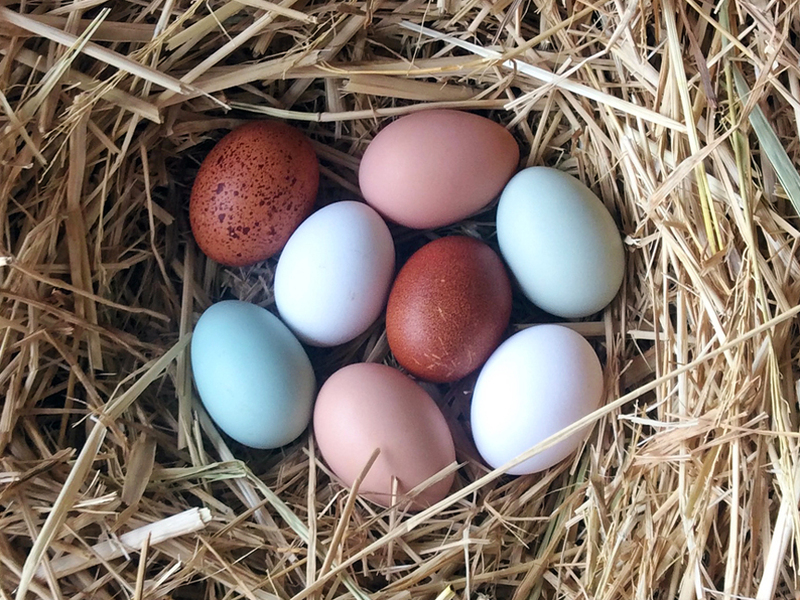 At Redwood Hill Farm we have chickens that lay blue eggs, and brown, green, speckled & white ones too. 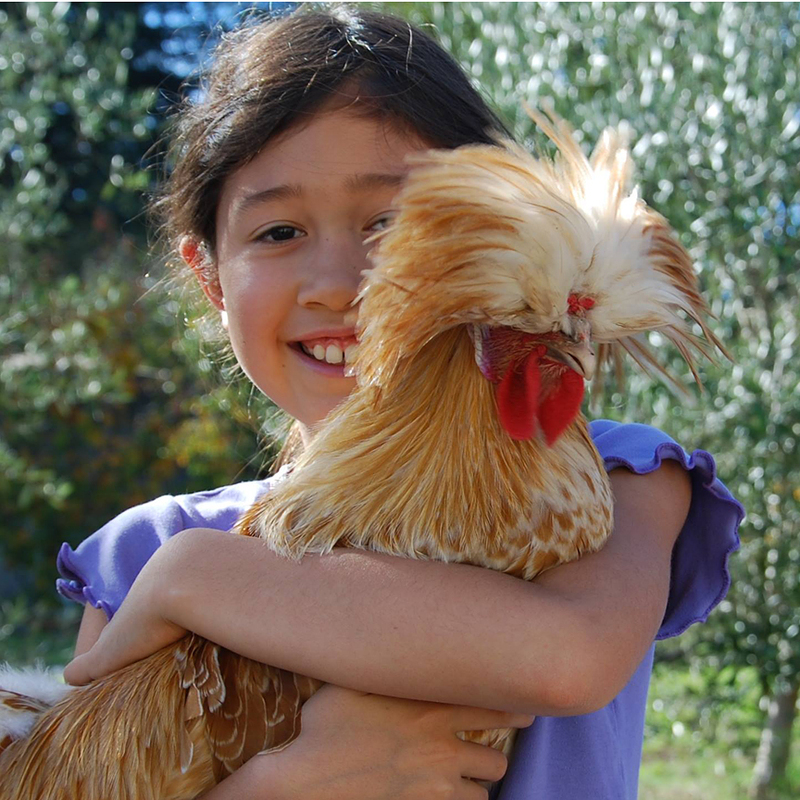 At Redwood Hill Farm, we have 27 hens and 2 roosters who were raised by farm children- Nicole and Colton Bice. The egg-laying breeds we have are Easter Eggers (chickens that lay blue eggs), Black Copper Maran, Cream Legbar, Plymouth Rock, Leghorn, and New Hampshire Red. Like all of the goats on our free range farm, our hens have names too! Some of the names are Henny Penny, Golden Berry, Honey Suckle, Olaf and Amera. The roosters’ names are Ivan The Great and Ivan the Terrible (you can probably guess which one is nicer!). Two of our breeds are heritage breeds, Copper Maran and Cream Legbar. These breeds don’t lay as many eggs as the others and take longer to start laying eggs, but they produce eggs longer than the other breeds and have beautiful eggs! We hope to increase the flock this year and Nicole is planning on hatching some chicks here on the farm. The chickens are fed locally made, organic grain and scratch, excess veggies from our gardens, and the excess yogurt we get from the Redwood Hill Farm & Creamery. They are allowed to roam free range in the Tagasaste field enjoying grass and bugs and we have noticed the caterpillars that were eating the Tagasaste leaves have greatly diminished since introducing the chickens. Last but not least, they naturally fertilize the tagasaste field with their droppings. Droppings in their sleeping area are collected regularly and used in the compost that fertilizes the hop yard. They scratch for bugs, which help keep weeds under control. Want to learn more about raising chickens? CLICK HERE and visit us and the chickens at a farm tour. Not only do our chickens provide nutritious eggs for the farm family, they also help care for the farm. We think our eggs are truly egg-cellent!